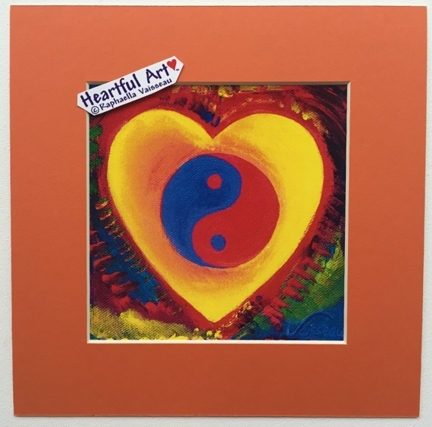 Tao Heart is a square print of an original painting by Raphaella Vaisseau. It expresses the clarity and balance of the Yin and Yang symbol of Taoism. According to www.Tao.org, "The yin/yang symbol has a definite line between the white and black areas; a well-defined contour distinguishing the two colors. This clarity of color symbolizes the need for clarity in all aspects of a life. Gray isn't found in the yin/yang symbol. Clarity requires one to commit to do nothing halfway; or to paraphrase an old adage, one shouldn't try to sit on two chairs. In becoming a spiritual person, a clear purposeful understanding of what is happening is required to determine appropriate action." Placing this symbol within the heart reminds a student of meditation to center within their own heart where balance, clarity, and understanding of one's path is revealed and can be aligned with. The vibrancy of the artwork speaks to the passion and energy of living life fully. Center in your heart. Seek balance and clarity. Love life.